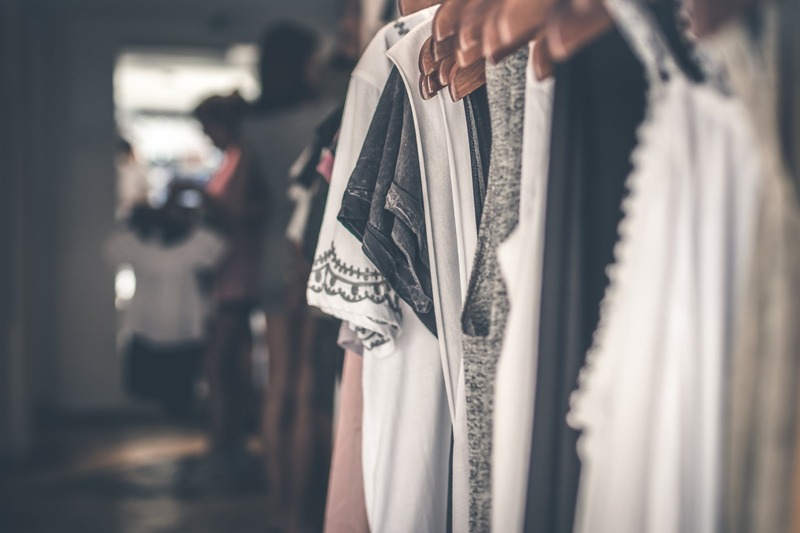 If you already have a well-stocked wardrobe and want to be more conscious of what you are buying, we have had a look at how you can rework what you have rather than always flashing the cash or hitting click to buy to get that hit. Before you do anything, look at what’s hot on the fashion front at the moment as this can really inspire you to take a closer look at your clothes and see how they could work harder for you. Social media feeds and magazines are a great way to asses which looks are in, and the ones that are out as this can spark ideas, and before you know it, you are dressing in a whole new way. If your wardrobes are bursting at the seams, it could mean that you can’t actually see what you do have to wear so end up in the same jeans and tee day after day. Take everything out of the wardrobes, put it all on your bed and re-hang everything you want to keep on wire hangers as these save space and prevent items from bunching and creasing. You can make it easy to navigate your clothes if you sort by style, colour and season and when you have done this you will have a better idea of what goes with what, and new looks can be created. If you have well-loved items that you still adore but are broken – mend them, don’t chuck them! A damaged strap, missing button or drooping hem can stop you from wearing something, so get it fixed and the problem is solved. If you can’t do it yourself, many dry cleaners offer basic repairs and if it’s heels that need a helping hand, head to the cobbler. Before you throw away the clothes that didn’t make the cut, think about selling or swapping them so someone else can love them. This a great time to call on friends to give you some feedback on your clothes and style and they may want to take what isn’t working for you, off your hands, and you could be in for a haul of goodies from them in return. Also remember that online sites, social media, vintage stores and charity shops are perfect homes for pre-loved bargains and it is so much better to keep a garment alive, than sending it to the landfill. We all know that accessories can give a favourite look a new lease of life, so this is the time to get out those bags, belts, jewellery and shoes and have a play around. Alice bands, scrunchies and scarves can give a special lift, caps come into play with sportswear and an animal print tote or neon slider will automatically give you style kudos. Once you have done all the hard work, make sure you wear the items you have kept. Don’t keep things for best, wear dresses that make you feel special, jeans that elongate your legs, and if you have polished those shoes, put them on your feet and shine, baby! What we would say, is don’t try to reinvent your entire wardrobe in one go. If you can breathe life into three pieces, that’s a great start, and the rest will follow. It is super easy to buy new clothes all the time because the prices are so low, but throw away fashion won’t do the environment any good, even if it does increase your Facebook likes. We have been looking at how you can update and transform the contents of your wardrobe, without adding to your carbon footprint. We understand that you want to look your best, so why not get changes made to the clothes you love so they look really fantastic? Adding darts to shirts and jackets, taking up hems and swapping buttons are all small things that can have a big impact. If you are a dab hand with a needle and thread, or have a sewing machine, you can make these changes yourself and you never know, it could turn into a money-making side hustle for you too. OK, we know there are some days when you want to kick back in your joggers and sweatshirts, but most of us look better when our clothes fit us well. If you love palazzo pants, then add a fitted top and heels to give you a smart look, and pair those flared jeans with a long-sleeved t-shirt, leopard print cardigan and white trainers, for a casual look, with an on-trend edge? It is amazing how a tin of polish can make a massive difference to your shoes, boots and even handbags. Use a clean brush to apply the polish, then buff up the leather with a rag (cut up and an old t-shirt, if we are thinking of sustainability) and watch your beloved possessions come back to life, and sparkle in a whole new light. Maybe you don’t need a lot of new clothes, you just need some decent underwear that works with, rather than against, your body. Shape-wear will instantly make your clothes feel better and create a flattering silhouette, and with a wide range of options out there, you are bound to find something that’s right for you. In the same vein, why not have a professional bra fitting and see the difference the right bra will make to your t-shirts, dresses and jumpers. Layering isn’t just a way to keep you warm, it is also a really easy way to breathe life into your existing wardrobe. Putting a thick knit over a midi dress, wearing a lace vest under a slouchy sweater, and bringing dungarees to life with a Breton t-shirt are all ways to change an outfit in an instant. Think about creating new looks with contrasting colours and clashing prints and rather than one big coat, layering a biker jacket with a hoodie is an easy look that will take you from one season to another. Mixing and matching your clothes will make them work harder for you, so don’t keep anything for best. That beautiful dress you wore to a wedding, can be made casual with a fitted jacket and flat pumps, jeans can instantly be made stylish with heels and a silk shirt, and remember that jewellery can brighten up anything, so don’t leave it in the box gathering dust. If there are items you don’t need anymore, take them to the charity shop which can also be your first port of call if you have a gap in your wardrobe, but don’t want to buy brand new. With Dry January out of the way and your body akin to a temple (right? ), February is the perfect time to go ahead and detox your wardrobe. Why not spend some time this month looking at what you have, and what you might need, and to get really organised so you look fresh and polished from now right through to the summer. Set aside a morning or afternoon when you can turn the phone off and just get on with the job in hand! Put it in your diary and stick to it. If you haven’t worn something in your wardrobe in the past six months, the chances are, you won’t wear it again. This is a time to be honest and ruthless so as you go through your clothes, make three piles – keep, sell, and give away. Those bright pink skinny jeans, the fluffy bomber jacket and those lime green cowboy boots didn’t work for a reason, so don’t hang onto them just incase. You might feel good knowing your wardrobe is bursting open with hundreds of items, but how many do you actually wear and really like? You might not believe us, but having 30 pieces you really love to wear will make your clothes work so much better for you. By doing this you can also see what is missing and what you need to buy, if anything. OK, how many pairs of jeans do you have in your wardrobe? 5, 10, 15…..more???? Jeans are a staple but one that is hard to crack. They need to be the right length, colour, shape, style and only then are they perfect. Cropped jeans elongate legs and there is nothing like a flash of ankle, mid-risers are hip flatterers and skinnies work on so many levels. See which ones fit, get rid of the ones that don’t, and buy a couple of new pairs that make you look, and feel, amazing. Come rain or shine, winter or spring, fine knits in black, grey and navy are essentials, end of. They are the most versatile items in your wardrobe, so it pays to invest in the best you can afford. They can be worn with tailored trousers for a smart casual look, match them with those perfect jeans you have found, or pop over a dress and you look as if you have pulled a new skirt out of the wardrobe! Whether you are 13, 30 or 83, a long-sleeved Breton t-shirt will always be your fashion friend. They are brilliant to wear with trainers and jeans on the school run or pop under a jacket and you have a more tailored look that will work well for a meeting with clients or lunch with friends. When you are organising your wardrobe, do it by the seasons. As we are in the middle of winter, you can pack away bikinis, kaftans, flip flops and straw hats – wrap them in tissue paper with moth balls, and store away until the snow has thawed and spring is in the air. You want everything else, to be visible so you can grab, and go. If you want the clothes you have kept to really work for you, create three outfits from each item you have kept. For example, that long-sleeved floral maxi dress can be worn alone, add a jumper and boots and you have a daytime staple, and if you layer with a fine knit and fake fur gillet, you have a boho look that Sienna Millar would be proud to be seen in. If you want them to keep their shape, always fold knits, t-shirts and jeans. You can either layer them in a chest of drawers or get storage accessories that hang in your wardrobe. Trousers and skirts can be hung on clip hangers and for dresses, go for slim hangers. The golden rule with hanging is that you should be able to fit two fingers between each hanger, and this way your clothes don’t get crushed or lost in a blur of fabric. If you have taken the time to find the clothes that work for you, it is worth sorting them out in a way that works too. Hang dresses, jackets and shirts together, and then have subcategories of work, home, gym, out-out and if you want to go one step further, complete with a spot of colour coordination. So, now you know what you have to wear, you just need to fill your diary with events to go to. Look through any magazine and you will see that pink is everywhere. If you’ve wondered whether this is the colour for you, the answer, this season at least, is… absolutely! From the palest blush to honey hues and bright splashes, this sugary shade is here for spring, and beyond, and we have looked at how you can make it chic not shiny. If you want to make a statement with pink, go for a coat. Whether it’s a ruffle hem cape, silk bomber jacket, fitted Chanel-esque blazer or even a lightweight puffa, it will be a wardrobe staple. These are perfect all great trans seasonal items and can be worn with jeans and boots while it is still chilly, but pop over a dress and flats later in the season and you will still be on-trend. From the catwalk to the High Street, there are some pretty pastel jeans on offer and they can be the perfect way to add a flash of pink into your day. Team with a navy long sleeve tee or an oversized sweatshirt in grey and silver trainers for a weekend look that will work all spring long. An easy way to add pink into your office or evening outfits is to wear a soft pink blouse which will take the edge off black trousers but still look professional. It you get the right shade for you, it will reflect onto your face and give you a healthy glow. You might not have thought about wearing pink shoes but this is a brilliant way to start your fashion adventures in pink. Metallic pink loafers worn with a dark grey pencil skirt is a killer office look and you can inject energy into your gym kit by matching steel leggings with cerise trainers. Pink accessories are an easier way to buy into this look before you really invest. Sunglasses, gloves, pumps, heels, scarves and bags are all the perfect way to add a pop of pink into your wardrobe and once you feel comfortable with this, you can go bigger. Adding pink to your beauty bag is a great way to update your look. Swap your bronzer for a cream pink blush and apply to the apples of your cheeks, for a fresh, spring look. Experiment with lipsticks and go for a pink that adds warmth to your skin and brings your eyes alive. A bright, vibrant nail varnish can totally change your look and worn on your toes with white gliders is a winning look that never dates. We hope we have convinced you that pink can work in any number of ways and you now feel brave enough to take the plunge. Ever looked at a friend and wondered how they always look great in jeans? Well, we are pretty sure it’s because they have tried on a variety of styles and colours and have jeans that not only work with their body shape but are comfortable and make them feel confident. From jeggings to skinnies, to bootcut and everything in-between, and we have done our denim research and hope it will allow you to find the perfect pair of jeans this spring. If you are looking for everyday ease, this timeless option is for you. Team slim leg jeans with a smart top and fitted jacket for work and a match with a long-sleeved t-shirt and fancy flats to create an effortlessly polished weekend look. You might think this style isn’t ‘in’ but it’s actually a really versatile option that is sleek and modern. Flattering for all bodies shapes, the bootcut jeans are great worn with heels or boots as they lengthen your legs and instantly slim your figure. Go for a dark denim option and try a number of brands to get the best fit for you. When it comes to being comfy, things don’t get better than jeggings. The combo of pull-on waistband and high-stretch fabric means jeggings hug your body and if you go for a quality brand, bagging isn’t an issue. While you might not get away with jeggings in the office, they are perfect when worn with a tunic top or an oversized sweatshirt and bright white trainers, you are onto a winning look. Skinny jeans are a wardrobe staple that aren’t going anywhere, so get involved. High-waisted styles offer a flattering fit and give the illusion of long legs, whatever your shape. Blue, black and grey are all versatile colour options and matched with statement sleeves or bold separates, you can look chic from morning to night. Loafers give you a masculine edge, heels create leg length and knee high boots add a touch of glamour. One step on from skinny jeans, these beauties are offer maximum style with minimum effort. A sharp, white shirt, pair of flat ballet pumps and a red lipstick are all you need to make this a statement look. Cut slim and straight from the hip to the ankle, straight leg jeans offer a really authentic denim look. The sleek lines are forgiving and a high-rise fit that lifts and sculpts your bottom, you will look and feel fab. Wearing a soft sweater over a fitted shirt and adding block heel boots is simple but effective. For cool chic, look at boyfriend jeans. Whether they’re indigo, distressed, ripped or low slung, the baggy boyfriend style offers a modern twist on classic denim. Pair with a slogan tee, statement belt and trainers and you have the ultimate combination of chic style and fashion comfort. In summary, straight-leg and skinny jeans are really flattering styles and a great place to start when it comes to denim, but why not be brave and try something new this year?